St. Augustine has a rich and diverse religious history, dating back to its founding on September 8, 1565. The first Catholic mass in the new world was celebrated by Father Francisco Lopez de Mendoza Grajales, chaplain of Pedro Menendez de Avelis at the site of the Mission Nombre De Dios. This event and the site are now marked by a 208 foot stainless steel cross. 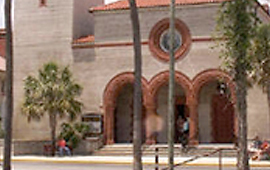 Religion also played an important part in the city’s Victorian era, most notably with Henry Flagler building the Memorial Presbyterian Church, the Ancient City Baptist Church and several other places of worship in the Oldest City. The present day diversity of denominations is shown in the listings below. We invite you to visit and explore the places of worship in St. Augustine. 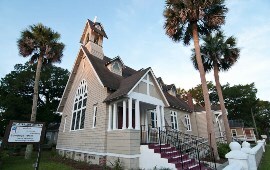 Please click on “View Worship Listings” to see all the houses of worship in St. Augustine. If for some reason your house of worship is not listed, please contact werespond@oldcity.com with the name, contact person, address and phone number. Becoming a church for all generations. Serving St. Augustine since 1881. Located at 8 Carrera Street, St. Augustine, FL 32084. Sunday Worship Services are 7:45am and 11:00am and a 9:15am casual service. Childcare is provided for all services. Adult Sunday School at 9:15am and 10:15am. Office hours are Monday through Friday 9:00am to 3:00pm. For additional information, visit our website. At St. Cyprian's, we're a diverse and inclusive community welcoming everyone to join us for weekly worship! Our parish life is guided by a commitment to spiritual inquiry, community service, and a progressive worldview. With the exception of summer, Jazz Vespers (an evening of community, music, worship, and wine) are offered the third Sunday of the month. We look forward to meeting you soon!